Make a plum cake tatin! I recently started a cooking club with a group of my close female friends. I hosted our inaugural meeting, and I knew that I wanted to make some kind of dessert that I had never made before. Earlier that week, I spotted Italian plums at my local market, and I bought a large bag of them. These plums are typically only available in late September and early fall. They are particularly wonderful in baked goods. They are sweet and tart, and add incredible moisture to the cakes they are cooked in. This recipe is from the beloved Ina Garten. I didn't change a thing, but I could see this being delicious with the addition of a little cinnamon. Other stone fruit, or even pears, could be substituted if you can't find Italian plums. I intend to make this recipe every year from here on out. Preheat the oven to 350 degrees F. Generously butter a 9-inch glass pie dish and arrange the plums in the dish, cut side down. Combine 1 cup of the granulated sugar and 1/3 cup water in a small saucepan and cook over high heat until it turns a warm amber color, about 360 degrees F on a candy thermometer. Swirl the pan but don’t stir. Pour evenly over the plums. Meanwhile, cream the 6 tablespoons of butter and the remaining 3/4 cup of granulated sugar in the bowl of an electric mixer fitted with the paddle attachment, until light and fluffy. Lower the speed and beat in the eggs one at a time. Add the sour cream, zest, and vanilla and mix until combined. Sift together the flour, baking powder, and salt and, with the mixer on low speed, add it to the butter mixture. Mix only until combined. 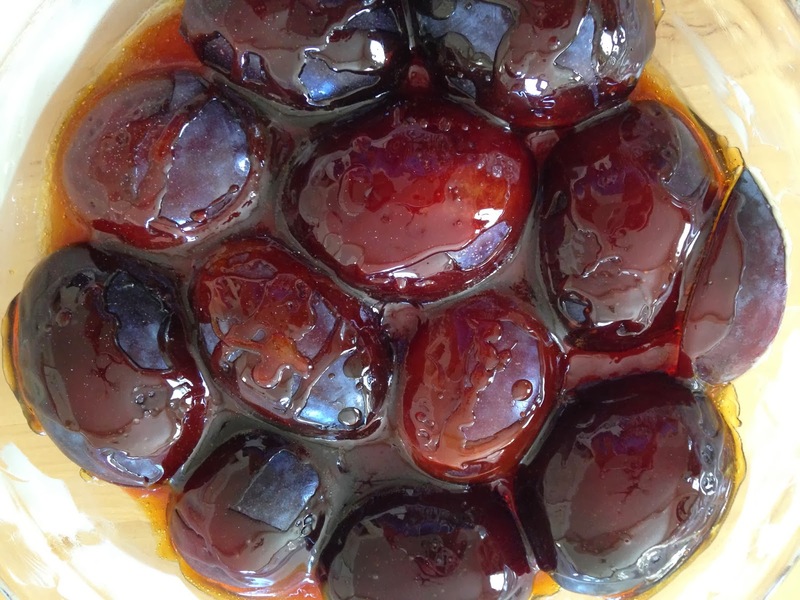 Pour the cake batter evenly over the plums and bake for 30 to 40 minutes, until a cake tester comes out clean. Cool for 15 minutes, then invert the cake onto a flat plate. If a plum sticks, ease it out and replace it in the design on top of the cake. Serve warm or at room temperature, dusted with confectioners’ sugar.